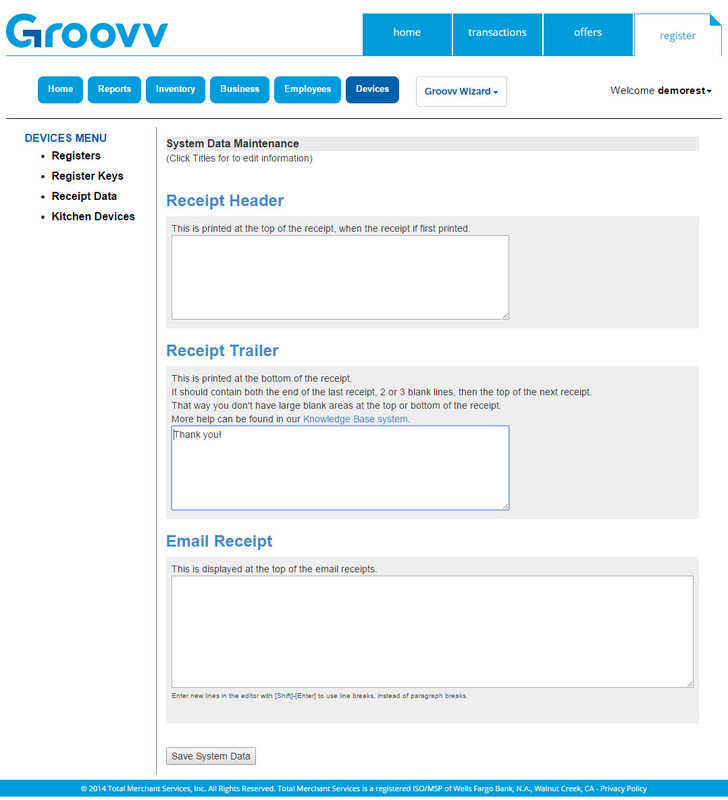 On this page you can adjust the Receipt Header, Receipt Trailer, and Email Receipts header. This text could be important business rules or a friendly message. Receipt Header: the text box should contain the information you would like to appear at the top your receipts. Your doing business as name, street address, city/state/zip and phone number will automatically be placed on top and center on your receipts. This text box should only be used other pertinent business information. Receipt Trailer: the text box should contain what you would like to be at the bottom of the receipt e.g. "Thank you for stopping by" or the store return policy as well as 5 blank lines after to compensate for the receipt data to be above the cutter or tear bar of the printer. Email Receipt Header: enter the text that you would like to appear at the top of your emailed receipts. Keep in mind that when using this text editor, the Enter key will insert a paragraph break. If you need to enter a line break, you will need to press the Shift+Enter keys on your keyboard. Once you have finished entering all of the text, click the button at the bottom of the page.